All dog and cat owners need to be very aware of a big threat to your pets health and comfort. Dental disease is one of the most common problems older dogs and cats face today and will affect 80-90% of all animals at some point during their lives. Often times, dental infections spread to the heart or other organs and can cause irreversible damage or even death. 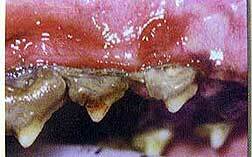 If your dog has brown tarter built up on the tooth surface and/or red gums, it's time to get it taken care of. Silent suffering...a word about pain "Animals show more signs of pain relief than the pain itself", "Nothing hurts worse than tooth pain and nothing feels as good as making it go away"
Dogs and cats are revered today as vital family members and rightfully so. People will sometimes do without so that their pet can receive necessary medical care. Because this bond is so intense, we often forget that animals instinctively had to fend for themselves in the wild many years ago. Today, domesticated animals frequently display instinctive traits that were once relied on to keep them alive in the wild. Most of these traits we don't recognize or just take for granted. Dogs are just supposed to bark. Right? One trait that pets often display to us is actually harmful in todays world. This trait is the masking of pain. To you, animal pain is only obvious when it's acute and they cry or involves a joint which makes them limp. Animals don't attach emotion to their pain. They don't complain and let it ruin their day. They don't mope around and sulk. In other words, they don't handle pain like humans do and yet this is what most people would expect from an animal in pain. Speaking from personal experience, most people would agree that dental pain can be very severe. But despite the severity of dental pain, dogs and cats go about life in an apparently normal manner. Rarely will an owner notice tooth pain in an animal. Pain signs and symptoms are vague at best and easily overlooked by even the most conscientious and attentive owner. We know that dogs and cats, like humans, are mammals and as such, have almost identical nervous systems which means they feel that same pain that we do. Research has proven this. Pain is something that can be prevented or controlled and we owe it to our friends to do what we can for them. When dental disease is the cause of the pain, the remedy takes only a couple of hours of professional treatment in most cases. What's puzzling to us is that animals show more signs of pain relief than the pain itself. After a dental procedure, it's not surprising to hear that a dog or cat is "much more active"..."acts years younger"..."eats much better"..."wants to play, etc." If you've ever left a glass of water sit for two days and noticed a residue or wondered what that slimy film on the bottom of the water bowl was, biofilms are what you are seeing. So what is it that causes dental disease? It all boils down eventually to biofilms and bacteria. When it comes to dental disease, because of the unique environment of the mouth, we measure bacteria counts in the billions. Bacteria that adhere to the enamel of teeth colonize and begin synthesizing molecules, the most important of which are carbohydrates. These carbohydrates are sticky and act as a glue to attract more molecules on the teeth, eventually forming plaque. 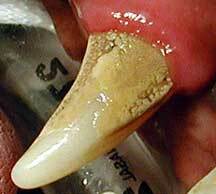 As time goes on calcium carbonate from saliva deposits on the plaque, hardens, and then becomes brown tarter. Tartar is made up of calcium salts, food debris, bacteria and other organic matter. It is orange to brownish in color and although soft when deposited, it quickly hardens like cement. It collects primarily on the cheek side of the premolars and molars, although it can occur anywhere on any tooth. Periodontal disease results when the bacteria at the center of this plaque move under the gumline. There are many different bacteria in the mouth that start the process of plaque development. Some are aerobic, and live off the rich oxygen supply in the mouth. As mentioned above, some of the bacteria in the plaque that migrate under the gumline go to an area of no oxygen, and are called anaerobic. The anaerobic ones tend to cause the most damage. The anaerobic bacteria cause an inflammatory reaction, and break down the periodontal ligament. The end result; the surrounding bone becomes infected and the tooth rots out. Also, as these bacteria migrate deeper into the tooth cavity where they enter the bone and blood supply to the tooth and can enter the bloodstream where they cause significant damage to internal organs. The heart, liver and kidneys are most often affected but other organs can be affected. Recent studies have shown (AVDS, Journal of Veterinary Dentistry, June 2008) that just having excessive plaque present on the teeth places the heart at risk. Sometimes several organ systems can be harmed at the same time. How do you prevent these bacteria from starting the problem all over again after the teeth are professionally cleaned and treated? 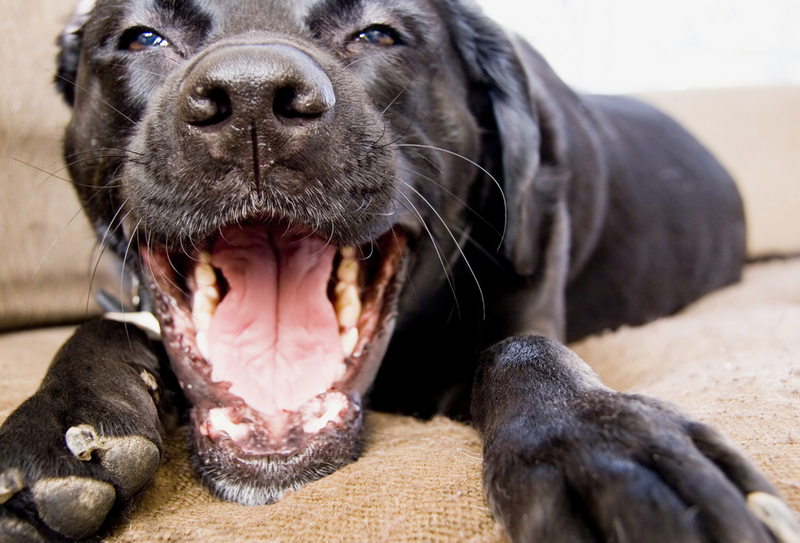 Brush the teeth, apply Ora-Vet weekly, and use the enzymes, chew toys or sprays on the teeth to minimize plaque buildup. There are several options and methods for prevention that we would be happy to discuss with you. Click Home Dental Care for more information on your roll in prevention. Symptoms of dental disease can range from subtle to extreme and are almost never noticed by people. Dogs and cats are masters of disguise! Dental pain does not cause a limp or other obvious mobility or behavior change so they suffer in silence. One of the most common signs is bad breath. Sometimes a pet with dental disease will wince when you touch it anywhere near its muzzle but in most cases, you will not notice any signs at all. Another possible sign is a partial or complete inability to eat (anorexia). A pet that has this problem may eagerly go to the food bowl, and either just looks at the food or drop the food out of its mouth after only a few bites. Other pets might drool from one or both sides of the mouth. Most of the time though, your dog or cat will go through life eating and drinking normally. Unfortunately, many pets do not show any symptoms until the disease is well entrenched and we have a difficult time correcting the problem. The important point to remember is the fact that once you notice any of these symptoms, your pet's dental disease is already causing discomfort or pain, and even affecting other body organs. Therefore, it is important for you to be aware of the existence of this problem, to learn how to perform a basic oral exam at home, learn how to brush teeth or use gels or sprays, and to bring your pet in for regular (every 6-12 months) dental exams by one of our veterinarians. Every 6-12 months seems like a lot to some people. Compared to the typical lifespan of a dog or cat and rate they age physically, it is not very frequent at all. In "pet years", 6-12 months is actually around 4-8 years depending on the breed. Your pet cannot tell you its mouth hurts, it is up to us, as a team, to ensure that this inevitable problem is properly monitored and treated before it causes discomfort and pain, and sometimes premature organ failure. Periodontal disease is a disease just like any other disease such as cancer, heart disease, pulmonary disease, kidney disease, etc. The effects on the body can be catastrophic and it will not go away without aggressive treatment. An explanation of the various stages of periodontal disease is listed below. The first picture shows what health teeth should look like. The gums are uniform in color. The teeth are white without accumulation of tarter. With brushing and regular home care, your pets teeth could look like this for the duration of its life. The first stage of the disease process involves the accumulation of plaque and tarter. This comes in contact with the gums and causes inflammation. At this time, bacteria are migrating under the gums where the most damage will be done. 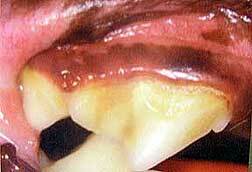 The picture on the left shows a band of inflamed (darker pink) gingiva. Remember, dark pink, red and brown are not normal colors in the mouth. Presence of these colors in the mouth often indicated disease. If this is ignored, the condition will worsen and the teeth will be at risk for loss. If the infection persists, other organ systems will be at risk too. The next phase of the disease process involves more tarter accumulation and gums that are so sore, red and inflamed that they begin to retract toward the bone and away from the tooth. At this point, there is no healthy gum to prevent bacteria from entering the periodontal ligament and bone. At this point, treatment will most likely reverse the damage under the gums with careful subgingival treatment and root planning while under anesthesia. 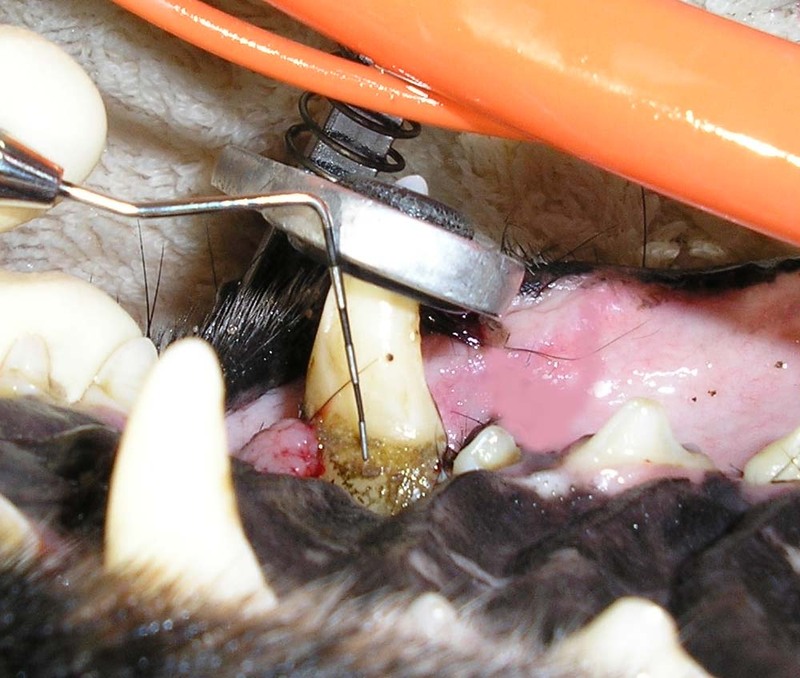 If you are seeing this on your dog or cats teeth, treatment is a vital or tooth loss and permanent damage will most likely result. In this stage, treatment is critical because now other organ systems are at risk. The animal is in a lot of pain and food intake becomes a real challenge. Bacteria has invaded the periodontal ligament which is the only thing holding the tooth in place. By now, up to 50% of the supporting bone has been lost. The inflammation is so bad now that the bone is involved and is starting to resorb. When this happens, the tooth loosens and allows even more anaerobic bacteria to colonize because a pocket has formed between the root and gum. Now we have real problems because most likely the tooth will need to be extracted surgically and the presence of infection adds risk to the procedure. The infection and inflammation has caused periodontal ligament attachment loss, greater than 50% bone loss with shallow root sockets. Adjacent teeth may also now be affected. This poor dog is in agony. Even simple tongue movements can cause great pain. The pus and blood drainage is constantly swallowed masking signs and symptoms so that the owner may still easily miss the disease. A thorough examination is necessary along with blood testing and X-rays to rule out life threatening damage caused by the persistent infection. The picture on the left shows advanced, Stage IV periodontal disease. The second picture shows a diseased tooth after cleaning revealing the damage caused by the disease. The gum and bone support is gone leaving the roots exposed. There is no chance of saving this tooth and there is a good chance that the infection that caused this may have harmed other organ systems. The 3rd and 4th pictures demonstrate an infection that is so severe that the bone that connects the tooth to the skull is gone but notice how white the outer surface of the teeth are. No one ever knew. The only complaint that the owner had was that the dog was sneezing. After removing the canine teeth, a large oronasal fistula (hole) was found. You could see the nasal cavity through the open root socket. All of the bone separating the root from the nose was gone so the pus drained into the nasal cavity. It's not uncommon for healthy appearing pets to present with this degree of dental disease. Animals are masters at disguising even the most severe pain. In most cases, we will discover this during an annual physical exam and will recommend treatment as soon as possible. 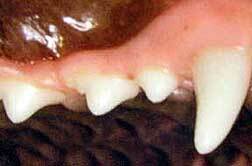 If you notice that your dog has teeth like those pictured on the left, schedule an examination as soon as possible. In all cases, anesthesia is required. Given the fragile environment of the mouth and the fact that gingiva is so easily damaged, we never do dental work on an awake patient. Simple hand scaling, a very primitive and out-dated approach to dentistry, does nothing for the disease under the gums where the damage is really done. Even the very best dogs can not be counted on to remain perfectly still and movement on their part can easily cause injury to the mouth while working with sharp instruments. Dentistry can be just as terrifying to an animal as it is to a human. Additionally, diseased teeth are painful and anesthesia/analgesia eliminates that concern. 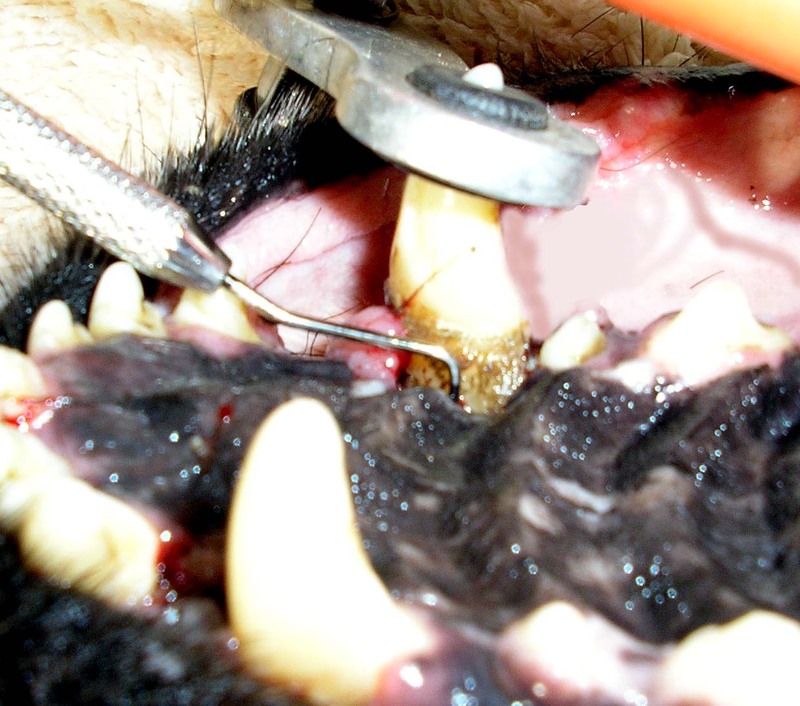 Some dogs require annual or biennial dental cleaning. With brushing and regular home care, the number of professional cleaning/treatments over the life of your pet can be greatly reduced. Depending on the condition of the dentition, simple power scaling, sub-gingival treatment, polishing and fluoride treatment may be all that is needed. In most cases, we will apply a surgical type of OraVet just before your pet wakes up from anesthesia. Subgingival treatment is probably the most important step in treating disease and preserving your pets teeth and health. Tarter itself is harmless to the tooth enamel but it provides a fortress for plaque to accumulate which is absolutely devastating to the root and surrounding bone and tissue once bacteria spreads under the gums. The presence of this foreign material and the inflammation that it causes, will allow the disease process to worsen over time ultimately resulting in bone infection, pain and tooth loss. It provides the perfect environment for infection and is a very effective conduit for allowing the constant supply of bacteria to invade. Root planning is the same procedure used in humans to remove contaminated, infected debris and tarter from roots that have lost bone support. The curettes that we use are designed to allow us to reach far up under the gumline to remove tarter and debris without harming the fragile gingiva. There are many different shapes and styles of curettes used depending on the size and shape of the tooth or root. Subgingival curettage and root planning are the most difficult parts of any dental treatment because it takes a long time to do a good job and doing a good job is extremely important. A normal dog has 42 teeth which equates to 84 possible sides to treat, 84 different approach angles, a few minutes per tooth...the minutes really add up. Routine dental cleaning usually requires only low power subgingival scaling which is done when the rest of the teeth are cleaned.The presence of disease may require a more complicated approach. In addition to root planning, affected teeth may require treatment with Doxirobe, a polymer gel that contains a potent antibiotic that leeches into the enamel and dentin. Long after the gel falls out, doxycycline continues to leech back out over several weeks warding off bacteria which allows time for tissues to heal. This new drug has been proven to save diseased teeth that would have normally been lost and has been very successful since its release in early 2004. 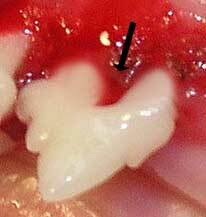 When the disease moves under the gumline and periodontal ligament and bone is lost, a pocket is left behind. This pocket provides a place for debris and infection to collect which accelerates the disease process. Root planning may not be enough by itself. We strip this area clean by root planning, removing contaminated/infected bone and flushing, and inject doxirobe gel deep into this pocket. Since bacteria prevents healing and progressively makes the disease worse, Doxirobe prevents this from happening and allows the gum to heal back down to the tooth surface and restore it's natural ability to ward off infection in most cases. When the disease has caused irreparable damage to the tooth and its surrounding bone structures, removing the tooth is the best option. At this point, rotting tooth is like a giant festering splinter with all of the associated pain and infection. Extracting the tooth removes the source of the trouble and sets the stage for healing. Depending on the tooth involved, extraction may be quick and simple or a very complicated and difficult procedure. Loose teeth are not necessarily easier to deal with because in order for that tooth to be loose in the first place, the disease process had to progress to a critical state which will require treatment of the bone and surrounding soft tissues, all of which must be addressed. Teeth with more that one root must be delicately sectioned into pieces to facilitate removal without harming the bone or fracturing the tip of a root. In most cases, a ceramic bone graft material called consil bioglass, will be placed into the open root sockets. This amazing material actually causes bone to grow and fill in the socket. consil is a human synthetic bone graft material that is used in fracture repair in people. Proper root socket treatment is critical. The sutures used to close a treated root socket dissolve over time and do not need to be removed. We will occasionally prescribe antibiotics to control the infection. Your pet will need to return to the office in 7 to 10 days for a follow up exam to be sure the gums are healing well after a major extraction. Some bleeding is normal after any dental procedure. Heavy bleeding should be reported immediately. The emergency clinic is open whenever we are closed (255-0770). 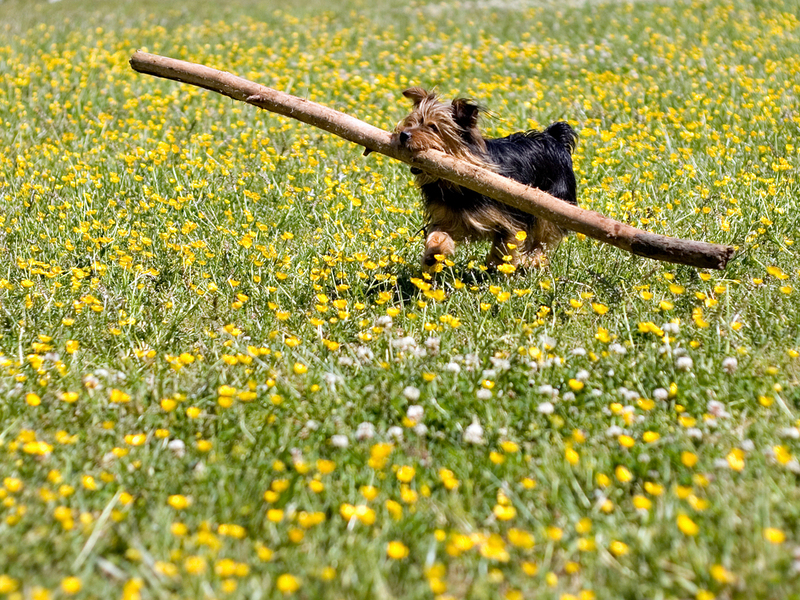 During the recovery period, it is very important that you do not allow your pet to chew on anything hard or sharp. The gums have not yet healed and can be easily injured. You may offer a small amount of water a few hours after you bring your pet home. If, after an hour, there is no vomiting, you may offer food. If you normally feed canned food, give only a small amount the evening your pet comes home. If you feed dry food, it must be softened in warm water. In either case, you should feed the food that your pet normally eats and is used to. Abruptly switching diets may cause other acute health problems such as vomiting and/or diarrhea. At the time of your pets follow up exam, we will probably prescribe OraVetto use weekly. This also gives you an opportunity to inspect the condition of your dog or cats teeth.